San Francisco 49ers backup quarterback Colin Kaepernick chose last Friday to remind America that black lives matter. It's a laudable goal, and one for which he should be commended. The role of the black athlete in addressing pressing social issues has moved from the “risk it all” activism of the 1960s to the “Republicans buy sneakers, too” attitude of the ’90s to athletes ready to risk it all at the peak of their powers today. Which is why Kaepernick’s move is so bold and brave. His NFL career is hanging by a "second" string, and with his actions Friday, he’s risked more for the movement than any black athlete in recent years. On Friday, after what would be an otherwise totally unremarkable preseason football game between the San Francisco 49ers and the Green Bay Packers, some intrepid cameraperson noticed that Kaepernick did not stand for the national anthem. 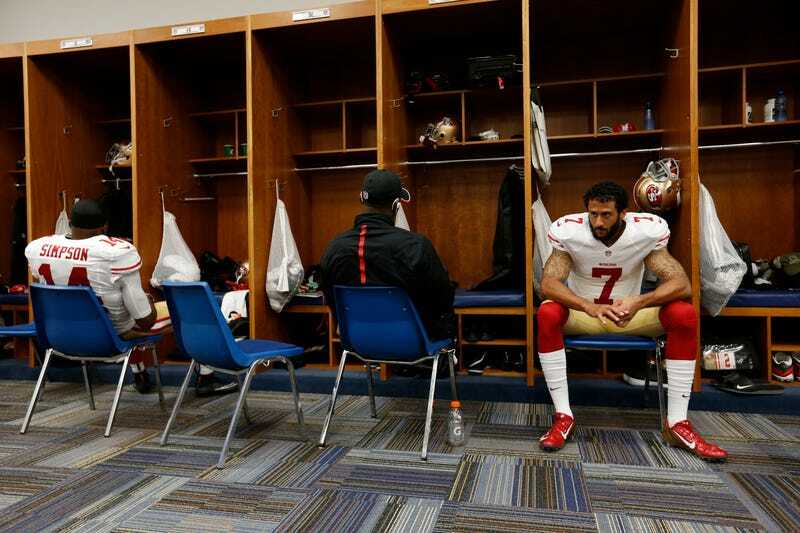 When asked later by a reporter why he didn’t, Kaepernick, in an exclusive interview after the game, told NFL Media: "I am not going to stand up to show pride in a flag for a country that oppresses black people and people of color. To me this is bigger than football, and it would be selfish on my part to look the other way. There are bodies in the street and people getting paid leave and getting away with murder." Kaepernick went on to say that he didn’t care if he lost endorsements over his position; he wanted to make sure he stood up for what is right. Above all else, Kaepernick is absolutely right and should be applauded. The national anthem is a racist song, the federal government hasn’t done enough to protect African Americans in the face of institutional racism, and Kaepernick knows that just because he is a wealthy athlete doesn’t mean he’s not endangered by police brutality and racial discrimination. Just ask tennis star James Blake or the Atlanta Hawks’ Thabo Sefolosha. Off the field, he was an advertisers’ dream come true. In an era when African-American quarterbacks are becoming the norm, Kaepernick had the playmaking ability of Newton with the highly marketable, racially ambiguous looks of Russell Wilson. 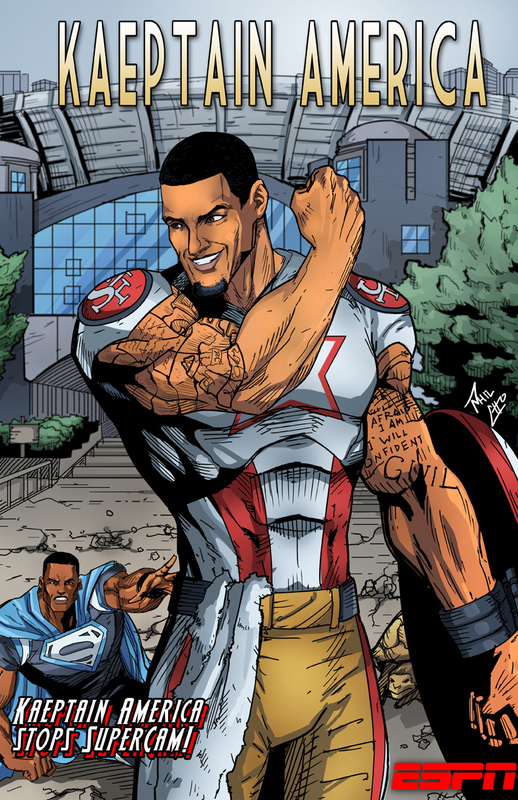 Fans called him Kaeptain America; he made Kaepernicking the cool alternative to Tebowing; he hosted the Kids’ Choice Awards on Nickelodeon; and he had endorsement deals with MusclePharm, McDonald’s and Jaguar and his own Beats by Dre commercial. Then it all fell apart. The 49ers started losing, he signed a sham contract that made him the laughingstock of NFL analysts, and by the 2015 season he was benched for perennial underachiever Blaine Gabbert. His best option this year is to be an overpaid backup or get traded. Now he’s taken a stand against racial injustice with a new coach who isn’t exactly known as the most racially tolerant guy out there. Colin Kaepernick has put modern sports activism in reverse. The model for black-athlete activism since the 1990s used to follow one of two paths. One group stayed silent on issues affecting the black community, avoiding any stands on any issues during their most successful playing years for fear of losing endorsements (Michael Jordan). The other group eventually became very vocal and active once they were no longer playing and had nothing to lose (ahem, Jordan again). However, this new generation of athletes has become more pro-active on civil rights issues while at the peak of their careers, but only when protected by on-the-court success. Consider LeBron James. James is arguably a top five basketball player of all time who encouraged the Miami Heat to wear hoodies in solidarity and remembrance of Trayvon Martin. Yet with all of his immense power and influence last fall, James didn’t want any part of the Tamir Rice situation in Cleveland. Why? Standing up for black lives and Trayvon was a lot easier when he had a championship ring with the Miami Heat than standing up for Tamir would have been before James won that first trophy for the Cleveland Cavaliers. Cam Newton was blackity-blackity black with a 15-1 record going into a Super Bowl against the corpse of Peyton Manning last February. Now, after a humbling loss and some meme-worthy play on his part, the “Blackest (Carolina) Panther” is suddenly claiming that racism isn’t a problem, and he’s filling out his “new black” application as fast as he can. WNBA players from the Minnesota Lynx got fined, then unfined, then chastised for speaking out against the killings of Philando Castile and Dallas police officers. I’m pretty sure the fact that the Minnesota Lynx are the reigning WNBA champions had something to do with their confidence in speaking out. The point is, most African-American athletes who speak out today do it from behind a championship podium, and it’s much harder for racists and conservative pundits to throw shade at someone whose championship rings are shining so bright. But if they don’t have a playoff berth or championship ring, they are less likely to speak. That’s what makes Kaepernick’s activism so brave. He’s got nothing to fall back on. He’s not a champion; he’s not the face of the NFL; heck, he’s not even a starter on his own team. When the racist trolls and the conservative pundits come for him, he will have nothing to protect himself with beyond his Christian tattoos, and he even gets called out for those. Not everyone, let alone a professional athlete, is built for a life of civil activism, and there’s no shame in that. Nevertheless, whenever professional athletes choose to take part in the larger movement for justice, it’s worth noting, applauding and supporting. This is especially the case when an athlete is holding on to his or her career by a thread and will have little to stand on professionally when the backlash comes. Let’s hope that Kaepernick’s activism shows other athletes that you don’t have to wait until you’re a champion on the field to be a champion for justice.